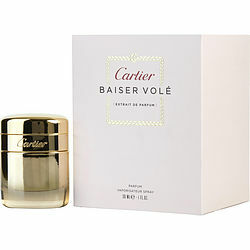 Available in a unique, elegant bottle, Cartier Baiser Vole is a sophisticated women's fragrance that was launched in 2011. Developed by Mathilde Laurent, it combines floral, spicy, Oriental, and citrus tones, creating a soft scent that is sure to entice. Its dominant scent of white lilies makes it the perfect fragrance to wear during the spring and summer months. It's suitable for daytime or evening wear, and a couple of sprays will last you throughout the day.